There’s not many points during the season when I have 3 or 4 weeks at “home” so the period after Criterium International was a welcome chance to get a little rest after the first swing of the season and lay down some solid training in preparation for the next block of races. Racing is the “meat and potatoes” of a life as a professional in this sport, but I relish the chance to get some quiet time and back the the simplicity of just riding. 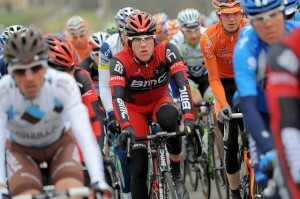 Yesterday it was back to business with my first belgian race of the season, the ardennes classic Flèche Wallone. This race wasn’t originally on my planned schedule for the season, but its always on honor to race these spring one-day classic races and I was excited to have the opportunity to line up as team mates with last years Flèche-Wallone champion, Philip. It was a tough 200 km re entry into racing after a few weeks off. Belgium didn’t disappoint and dished us up an authentic serving of cold, wet and WINDY weather which made for an especially intense and nervous day. In the end we all did well to stay out of trouble and protect our leaders Greg and Phil, with the later delivering a fine uphill kick up the viciously steep Mur de Huy for a solid 3rd place. Now we have a few low-key days of hotel living as we rest up from yesterday and get ready for Sunday’s Liege-Bastogne-Liege. I’ve only raced LBL once, but at 260 km long and with as much climbing as a BIG mountain stage of the Tour de France its no doubt one of the most demanding one day races on the calendar. It will be an honor to line up with Phil again as he is also the defending champion at this race. That brings an extra sense of pressure and responsibility but we are up for the challenge and looking forward to it. Maybe someone could send us some sun, please? The first Euro Pro/World Tour race of the season has now come and gone. Sitting on the “happy” side of the race and reflecting back I’m once again reminded of why they call these races “Pro” Tour. Having a full Peloton of the worlds best goes a long way to up the level of racing. The stress and tension, especially in a often windy race like P-Nice goes a long away to make these types of races as brutal on the mind as they are on the body. The best part of each day is when we get back to the bus and know we have safely made it through one more. Some days I felt more like a cave-man than a bike racer. Luckily I’ve developed a knack for forgetting the bad/tedious/dangerous/insane and can move on from one day to the next. Compared to the teams performance at the race last year, we pulled a sharp 180 degree turn for the better. A lot of that can be contributed to Mr. TVG since he was the one doing the actual result getting this week, but I could also tell that I was a notch up from where I was last year this same week. It was motivating and inspiring to have fellow american to rally behind. I don’t want to hear anymore fuss about the USA not having a legit GC contender for the future! For now its back to Girona, which feels more like home than it ever has before. The sun is shining and i think its almost time to put away the winter jackets. I am looking forward to banking 10 days or so here with Jamie and then it will be time to “game on” again at Criterium International. The few days back in Girona since GP Lugano have been nice ones. A little rest, a couple tune-up rides (Thanks to Jamie for the motor-pacing!) and its now back on the road for Paris-Nice. Its hard to leave Girona this time of year. Spring has fully sprung but its early enough in the game that my allergies have been kept in check. France on the other hand, is a big bag of “who knows what?” this time of year. We DO know the racing will be especially intense and hard fought as this is the first time in 2012 that the full Pro Tour peloton will be together in Europe. And we also KNOW that we are likely to be indoor camping at one of France’s finest Campanile hotels sometime in the next week. High life here we come! Reflecting on last years Paris-Nice makes me cringe a bit, but I feel like I’m another year stronger, as well as wiser and am looking forward to getting it going with the team and some of my new team mates who I haven’t had the chance to race with yet.